Who picked my tea? Who made my clothes? Who sewed my football? So many goods can be bought with a fair trade mark. flowers and gold, so when you shop, look for the FAIRTRADE Mark. Come and see a wonderful large range of many of the producers products at a great annual sale event. This is the web site of the Mid-Formartine Fairtrade group. We originally set out with the aim of making our area a fairtrade zone. 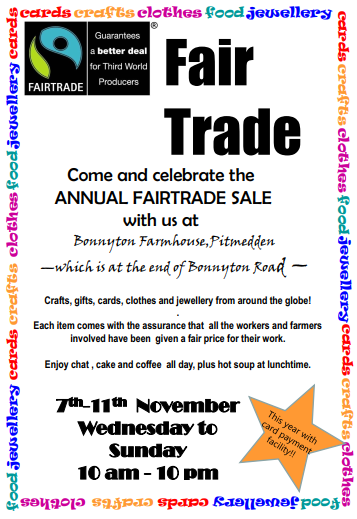 Having recently achieved this we are now aiming to increase awareness of Fairtrade in business and community life. On this site you will be able to find out about us and what we are doing to achieve our goals.